2018 is your opportunity to build new skills, expand your knowledge and get certified – but how do you decide what certifications you should achieve? Read on for an in-depth look at the top 10 certifications of 2018. This list (in no particular order) covers certifications across cyber security, data protection, networking, cloud technology and project management. To beat a hacker, you need to think like one. That means learning how to hack and then using those skills to safely secure vulnerabilities in a business. EC-Council’s Certified Ethical Hacker (CEH) is one of the few certifications to teach real hacking tools and techniques. Achieve it and you’ll learn how to write exploit codes, perform privilege escalation and identify common hacks, like SQL injection and more. 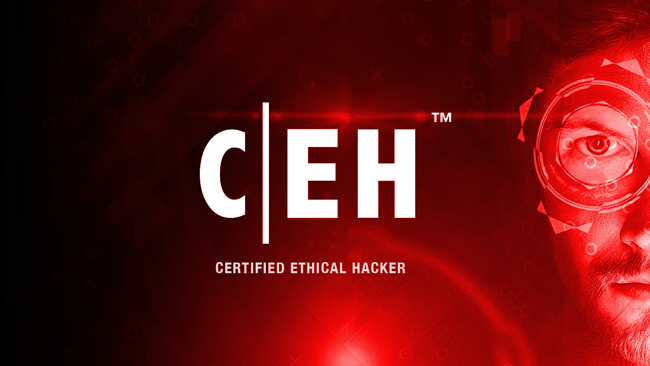 Practical experience is key to ethical hacking and on official CEH courses you’ll even get access to over 2,200 hacking tools and 140 real-world labs. As massive hacks continue to devastate businesses, ethical hacking and penetration testing knowledge is now in high-demand. The average salary for a Certified Ethical Hacker is £53,375 and contractors command an average daily rate of £500 (ITJobsWatch). Achieving the CEH is your first step towards a career in penetration testing. Next, continue to build your knowledge by taking on the follow-up ECSA, further specialising your penetration testing skills. The CEH is also beneficial to networking professionals wanting to boost their knowledge of network threats. And for professionals that hold the CISSP certification, it can provide a tangible introduction to physical hacking techniques, a great companion to the managerial skills taught in the CISSP. At a time when businesses are aggressively competing for the top security talent, the CISSP certification proves you’re among the cybersecurity elite. The CISSP proves the highest level of knowledge, experience and credibility within information security. It also builds the skills needed to design, engineer, implement and manage information security programmes. As the certification focuses on the managerial aspects of cybersecurity, it’s even undertaken by UK law enforcement staff tasked with responding to cybercrime. Despite the rising popularity of the CISSP, there’s only approximately 100,000 of them around the world (compare that to over two million CompTIA certifications issued). But with a challenging exam and demanding prerequisites, it’s easy to see why the CISSP remains the gold-standard IT security certification. Becoming a CISSP is also the path of least resistance for IT security pros climbing the corporate ladder to the prestigious CISO position. By gaining the CISSP, you’ll demonstrate that you’re devoted to your career and serious about advancing it. As one of the most respected networking certifications, the CCNA (Routing and Switching) certification is ideal for entry-level network engineers working with Cisco technologies. You’ll learn skills needed for network support positions, the starting point for any successful careers in networking. Plus, achieving a Cisco certification is highly recommended (and often required) for any professional working with Cisco kit. Becoming CCNA certified will place you within Cisco’s certification programme, which provides you with professional credentials from entry-level to Cisco Certified Architect (CCA). As such, the CCNA is a solid foundation of skills for any networking career, making it one to achieve for any networking professional in 2018. Demand for Enterprise Architecture (EA) surged in 2017, as one of the skills that is now the “most scarce”, according to a recent HarveyNash & KMPG survey. The Open Group Architecture Framework (TOGAF) is now the most popular EA framework and thousands of organisations now use it to build a complete view of their strategy, process, information and IT assets. To properly implement and maintain the framework, businesses rely on TOGAF certified professionals. Achieving the TOGAF certification marks years of experience and requires months of studying to pass the two challenging exams. With the continued demand for EA implementation globally, TOGAF is a key certification for any enterprise architecture professional to achieve in 2018. The second certification from (ISC)2 to make this list, the Certified Cloud Security Professional (CCSP) validates cloud security skills at the highest level. The CCSP certification builds on existing high-level (ISC)2 certifications and holders of the CISSP are prequalified to sit the CCSP exam, with no other prerequisites required. Those without the CISSP will need a minimum of five years’ full-time work experience in IT across the six domains of the CCSP. Once you’re qualified to take on the CCSP, it’s well worth achieving in 2018. The CCSP is a reflection of cloud security best-practice and demonstrates your knowledge of cloud application, platform and data infrastructure security. You’ll also get to grips with compliance, legality and privacy – crucial skills that you may need when GDPR is introduced in 2018. Or, learn about alternatives to the CCSP and our picks for the 10 best cloud certifications of 2018. Over 50% of European businesses are unprepared for General Data Protection Regulation (GDPR), which comes into effect in 2018. GDPR skills are already a top priority for organisations and demand is set to peak in 2018. While there is no official GDPR certification, there are a number of widely-supported credentials available for professionals to build and prove their knowledge of the data protection regulation. Firebrand’s accelerated GDPR training will introduce you to the regulation in just three days. You’ll study GDPR's relationship to current data protection and privacy legislation and learn the multi-jurisdictional consequences imposed by GDPR. Whether you’re an auditor, risk practitioner or contractor aiming to capitalise on the demand for GDPR skills, this is the year to get GDPR certified. Before GDPR becomes law, organisations may need to appoint or train a Certified Data Protection Officer (CDPO) to monitor GDPR compliance. Beware: SMEs are not exempt from the requirement to appoint a DPO. Because of this, demand for Data Protection Officers and the skills necessary to excel in these roles is set to peak in 2018. Again, there is no official certification for Data Protection Officers but prestigious organisations, like PECB, have created valuable Certified Data Protection Officer credentials. Learn how to manage a businesses’ compliance framework in line with GDPR regulations in just 3 days. Firebrand’s award-winning CDPO, provided through PECB, is your fastest way to become a Certified Data Protection Officer. One of Microsoft’s latest additions to their massive certification portfolio, the MCSE: Cloud Platform and Infrastructure builds and proves your knowledge of Microsoft cloud and data centre technologies. 2018 may be your best opportunity to achieve this pinnacle cloud certification; hiring companies increased their searches for Azure at a year-over-year rate of 62 percent, according to a report from job website, Indeed. Microsoft’s new MCSE certifications are attainable through a wide range of electives – from Azure to big data analytics. This means professionals can achieve this MCSE in any way they want. For Azure specialists, this certification can be achieved by passing just three Microsoft exams. Microsoft streamlined their technical certifications in 2017, so if you aren’t already familiar, make sure you understand the changes before pursuing any Microsoft certifications. Demand for project managers is high and it’s now expected 15.7 million new project managers will be needed across the globe by 2020. Complete your projects on time and within budget with skills gained from the PRINCE2 certification - the most popular project management framework in the UK. The skills gained by achieving the PRINCE2 will ensure your projects have a common and consistent approach, regular reviews or progress against plans and the assurance that projects must have a business justification. PRINCE2 was updated in 2017, marking the first major revision since 2009. For more information on the update, which emphasises how PRINCE2 can be tailored to any organisation or project, take a look at this introductory article from AXELOS. Firebrand is the only provider to offer both the Foundation and Practitioner course in just three days. That’s a world exclusive. At a time when cybersecurity breaches are hitting headlines daily, recognised information security certifications are becoming increasingly desirable for organisations and professionals. The CISA is a world-renowned certification for those who audit, control, monitor and assess information technology and business systems. Achieving this unique credential proves you’re capable of assessing vulnerabilities, reporting on compliance and instituting controls within enterprises. Firebrand’s CISA course is the only training to include the certification exam, which you’ll sit onsite during your training centre. 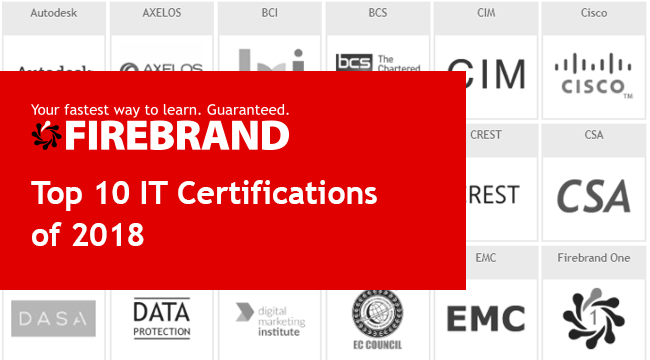 Get CISA certified with Firebrand in just 4 days.